TRUE LOVE AT THE LONELY HEARTS BOOKSHOP follows the life of Verity Love, a self-confessed Jane Austen fangirl and manager of London bookstore Happy Ever After. Fed up of her friends trying to hook her up with lonely individuals, Verity decides to make up a fictional boyfriend whose presence is very useful for getting her out of social events. But when a case of mistaken identity forces her to introduce a perfect stranger (Johnny True) as her boyfriend, Verity’s life suddenly becomes much more complicated and by the end of the summer, there’s a bad case of heartache that even Verity’s beloved PRIDE AND PREJUDICE might not be able to cure. Johnny’s eyes were a very definite blue now. Like the sea in winter; frost-tipped and cold. Verity suspected that he was a Darcy. It was very rare to meet a Darcy. It probably came from having read Pride and Prejudice so many times that she knew it off by heart, but on meeting new people, Verity always found herself assigning them roles in Pride and Prejudice. She’d met a lot of Jane Bennets and Charles Bingleys, far too many Mr Collinses, an occasional Wickham, but a Darcy was rarer than a single man in possession of a good fortune who was in actual want of a wife. And actually meeting a Darcy wasn’t that much fun. In fact, it was unbelievably awkward for a count of ten, then Johnny’s phone beeped. As he picked it up Verity realised that there was no good reason to stay and suffer. She said goodbye, quickly got up, though Johnny was riveted to his phone and gave no acknowledgement of her hasty departure. ‘Stick both glasses on my tab,’ she yelped at Luigi who still couldn’t hide his disbelief that Verity had broken with her usual Friday night routine for the first time in three years. Not only that, she’d also been seen in the company of a man. 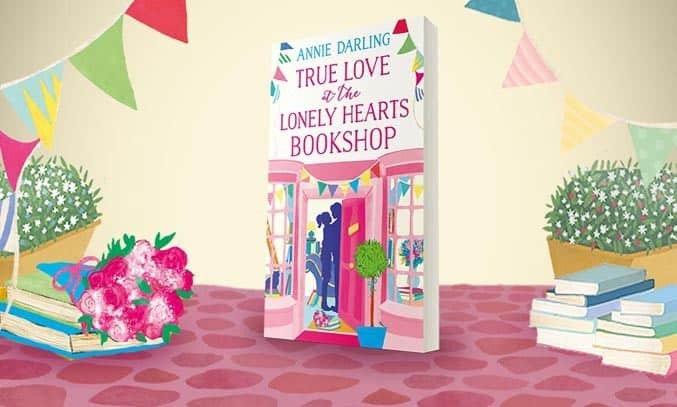 If the above extract has whetted your appetite for more, be sure to head back to Frankly My Dear UK tomorrow to read our full review of TRUE LOVE AT THE LONELY HEARTS BOOKSHOP and for a chance to win a signed copy of the new book by Annie Darling. TRUE LOVE AT THE LONELY HEARTS BOOKSHOP by Annie Darling is available on Amazon* and Harper Collins. *This post contains affiliate links, which means that if you click on one of the product links, the site may receive a commission for the referral.